Many of you may have noticed that Brian King is holding a one for one swap, if you missed it - you can click here to see it. I spoke with Brian, who is a fellow team member on the Global Design Project with me, and he is so sad that he wasn't able to offer it to Australia. I asked if he would be fine if I offered a one for one swap in Australia based on his idea. He thought it was a brilliant suggestion and is so happy that others can benefit from his idea! Sooooo.... I am offering a swap for Australians! May of you know that I LOVE sending and getting others to participate in RAK cards (Random Acts of Kindness) So this idea just touched my heart! You just make one card and mail it to me with a self-addressed, stamped envelope. I will then send you another card from what could be a random stranger! It is going to be so much fun! I know you are all going to love it. Brian has run a few of these swaps and said they were fantastic. a handmade card standard size designed by YOU, no CASEing for this swap. Please make every effort to use products from the current Stampin’ Up! catalogues. a self-addressed (that means your address), stamped envelope (that means put enough postage on the envelope). Stampin' Up!® Demonstrators and non-demonstrators can both play along! THEME: Positive Encouragement - Thank you, You rock, You're awesome, thinking of you, congratulations etc. These days it is nice to send a card just because - because it can encourage someone and build them up when they might be feeling a bit meh or even depressed. A handmade card and happy mail can make a big difference and it feels so good to receive but also to give that positive encouragement to others. Please don’t write on the inside of your card so that the recipient can use it (if they choose to), but feel free to stamp your name on the back. I will gather the cards I receive and will mix them up and mail them out so that everyone who sends me a card will receive a card in return. How much fun is that! I must limit participation to one card per person and to only Australian residents. Please mail them as soon as you can – but make sure they arrive by Friday, April 29 – that’s about THREE weeks away. That’s when I will sort them and then mail them out. I will also include photos of some of the cards on my blog (giving proper credit to the creator, of course). I know that you are going to get some awesome feedback on your cards and it will be so much fun to see them all on my blog in coming weeks. Who’s in? Email me if you have any questions kyliebertucci@me.com. Let me know what you think of this idea and if you are excited about it - because I know that I am! 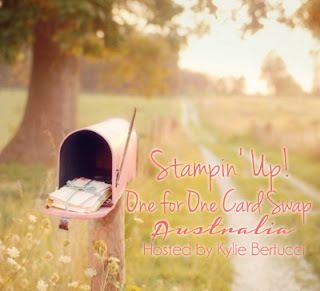 Please tell your friends and Stampin' Up!® team members as the more that play along - the more fun it will be. Thanks so much for your continued support of my blog and creations. I receive so many lovely cards and messaged and it warms my heart. Being encouraging to one another is so important these days as it is sadly lacking. Thank you for doing your part in making a difference in other peoples lives by your kind, encouraging words and actions. Thanks Brownyn! Should be lots of fun! I love your theme! Positive encouragement. I have a few special boxes full of thank you cards that I've received over the years of volunteering at my kids schools. Some day when I'm feeling blue, I'm going to reach in to those boxes and read a few cards. It will remind me that I made a difference in someone's life. Maybe that's why I love card making so much, it gives my customers and friends a way to show someone that they truly appreciate them. Now I just have to send more of the cards that I make! Great to have found you Kylie, I really enjoy all of your info and I've joined your #imbringingRAKback so cool! Awww Carole! That is so nice to hear - I agree completely! Thank you for your support and for being part of my RAK card movement. It has been so rewarding for me - getting me creating AND sending them out too. I am glad you have found me too! 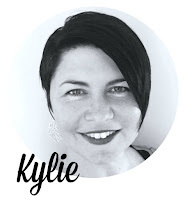 Sounds like great fun Kylie! I have certainly stepped up my card creating since finding your blog and joining in with challenges etc. I hadn't realised how motivating it was to participate in these challenges - I have found myself doing things with colours and styles that I would never have attempted if I was left to myself! Thanks heaps!! Hello Tasneem! I have sent you a Facebook message. :-) thanks for your comment.